Rosary Makers have been making One-Decade Rosary Beads for different purposes. Now we have a request for 27,500 One-Decade Rosary Beads, which the Sydney Catholic Education Office is going to distribute to all Catholic Secondary Schools in Sydney Diocese, together with a Rosary Card which is being provided by Jeffrey Vassalo in Sydney. Naturally I do not expect our Guilds to be the only suppliers of these Beads, Jeffrey also has various other groups who are making beads for this project, but I would like to assist in any way we can. One of the ways we achieve our major objectives is to promote the Rosary, and this is certainly a worthwhile Rosary promotion to the children who will be our future leaders in all fields. So they would like to have them all in by mid-late September to be able to organise distribution. That got me thinking about the design of the One-Decade Rosary Beads, and I came up with something a bit different to the usual ones. A photo of this design is below. The final end of the cord is hidden, looks better, and also is less likely to unravel. The beads, even though only one decade, can be used to pray the full Rosary of five decades, because having the extra 5 beads next to the Crucifix, means that all necessary beads are included. 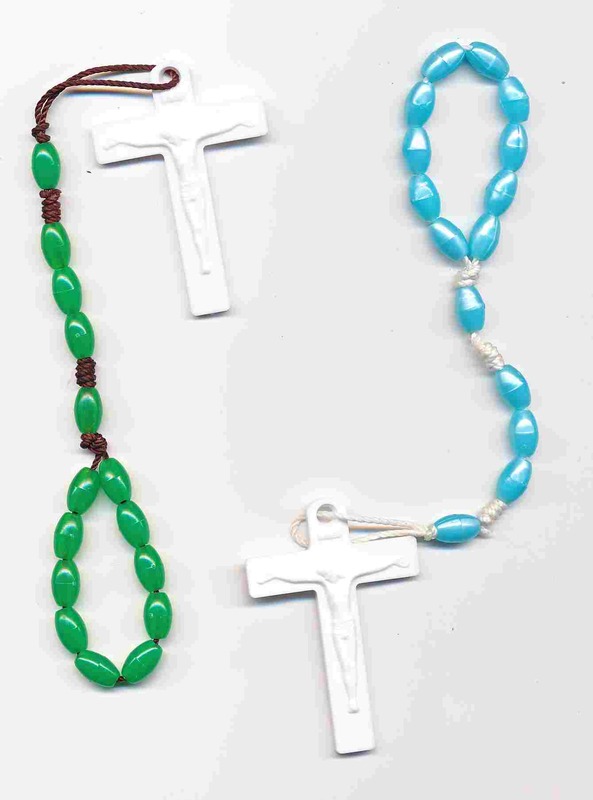 No different techniques are necessary - other than those which Rosary Makers already are familiar with - feeding on the beads, tieing the joining knot, attaching the Crucifix and hiding the cord end back in the last bead. Whether you adopt this design or stay with what you have already been doing is up to you, I don't mind either way. If you are able to assist towards the 27,500 One-Decade Rosary Beads needed for this particular School Rosary promotion, please advise Headquarters, and we will give you the correct address to send your beads to. Please also advise us at HQ on how many you ultimately send, for our records. The cord length is 22 inches. The easiest way to do this is to take a piece of timber, anywhere from ¼ inch thick to ¾ inch, approx.2 inches wide, and 11 inches long. (In place of timber you could use stiff cardboard. Cut up an old corrugated cardboard carton into two pieces say 11inches long by 3 inches wide, and glue them together to stiffen them. Cut a small piece out of the centre of each end, leaving a small section jutting out on each side, so that when you wind the cord on it doesn't slip off. Wind the cord around it as many times as you wish, say 10 or 20 times. Slip a pencil or a peg or a small piece of wood between the cords and the timber, about in the centre, so that the cords are slightly elevated from the timber. Then brush some stiffening liquid on to the cords just near the pencil, and for a length of about 2 inches. I use Sanding Sealer, but fabric stiffener would do as well, or nail polish or similar. I have also used Selley's Aquadhere (PVA glue) - it's not bad, but not as good as Sanding Sealer. When the cord is dry ( say next day) cut through the cords in the middle of the stiffened area, and you have a number of cords stiffened on each end. If you do the cut on the diagonal, rather than straight across, both ends will be slightly pointed, making them easier to slip through the beads. Tie a loose knot about 4 inches from one end, and slip ten beads on from the other end. Now untie that loose knot, and bring the two pieces of the cord together. One will be about 3 inches long, and the other will be about 16 inches long. Using the plastic tool for Cord Rosary making, tie the two ends together in the usual way. Slip a bead over both pieces of cord, and cut off the short piece of cord where it emerges from that bead. Using the plastic tool, tie a knot in the usual way against that bead. Feed on 3 more beads, and tie a knot as before. Slip on the final bead, and the Crucifix, and attach the Crucifix as you would in an ordinary Cord Rosary, feeding the end of the cord back through the final bead, and then cut off the projecting bit. You could us a different coloured bead for the two Our Father Beads if you wish, or all the same colour, its just a matter of personal preference. Brown cord is stiffer than white cord, so if using Brown cord you could possibly omit Step 4 above.